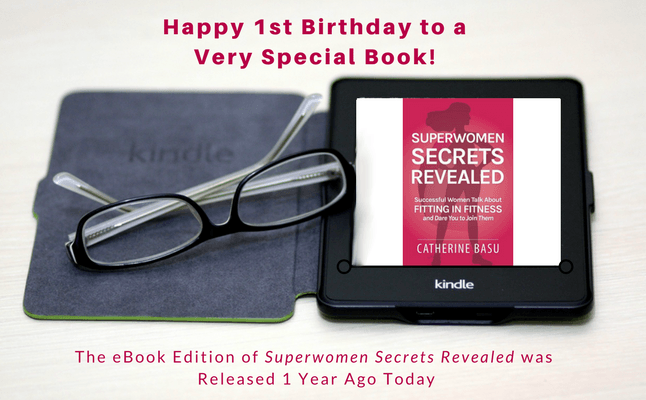 Happy 1st Birthday, Superwomen Secrets Revealed! Believe it or not, one year ago today my 1st book, Superwomen Secrets Revealed was released as an eBook. To celebrate her first birthday, head HERE to grab a copy of the eBook (the version of the fitness book that's officially 1 year old today, December 7th, 2017) for ONE cent less than ONE dollar - just $0.99! Make a donation to Girls on the Run of Southern Maryland to help their chapter get started (all proceeds of the eBook from December 2016 went to this nonprofit that we're still giving back to - head HERE to learn more about this month's fundraiser!). Celebrate the book being a #1 Download in not one, not two, but THREE categories! Superwomen Secrets Revealed was a #1 Download and Hot New Release in Quick Workouts, Women's Health, and Women in Business on Amazon. Brag about having over 35 five-star reviews on Amazon. Enjoy Book Tour stops in Houston, TX, Mystic, CT, West Hartford, CT and Newport, RI. How Does a Book Celebrate Its 1st Birthday? Thanks for joining in on the fun of this day with us! Don't forget to get your copy of the eBook for ONE cent less than ONE dollar to celebrate her 1st birthday HERE and tell a friend! Looking for a unique gift idea for your workout buddy or a female entrepreneur? Hardback copies of Superwomen Secrets Revealed are available anywhere books are sold and are chock full of fitness and life tips. Fit Armadillo owner and author of Superwomen Secrets Revealed, Catherine Basu, also has a few copies on hand and would be happy to sign and dedicate one to your lucky friend. Head HERE to see if she still has any in stock! What Will Superwomen Secrets Revealed Do Next? She has several 2018 Book Tour dates lined up! Get on her email list HERE to be the first to know about event locations and times. She'll be in California in January, Connecticut in late February/early March, and West Palm Beach area of Florida in the middle of March. Want author, Catherine Basu, to speak to your group in 2018? Send your dates and request to Info (at) FitArmadillo (dot) com. Her speaker reel can be found at the bottom of THIS PAGE. Looking forward to another wonderful year thanks to your support!